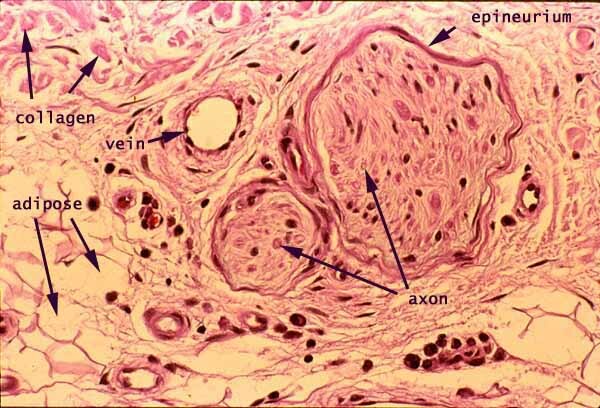 This image shows connective tissue deep in skin. A pair of small peripheral nerves are conspicuous features, along with several small blood vessels and a small amount of subcutaneous adipose tissue. Fibrous connective tissue of the dermis occupies the remaining area. Nuclei within the nerves may be either Schwann cells or fibroblasts of the endoneurium. A cluster of lymphocytes appear below the word "axon". Only the largest, myelinated axons are readily visible in routine light micrographs. Although only a few axons are noticable in the nerves illustrated above, each probably contains scores of smaller axons. In skin, large myelinated axons generally serve the sense of touch. Unmyelinated axons are associated with pain sensation and with autonomic motor function (controlling vascular smooth muscle and sweat glands).